There is no doubt that our family of Canisius alumni go on to do amazing things with the opportunities and education they have been given here. Justin Karcher, ‘07, has become an accomplished poet and playwright, and he began his journey right in our very own halls. 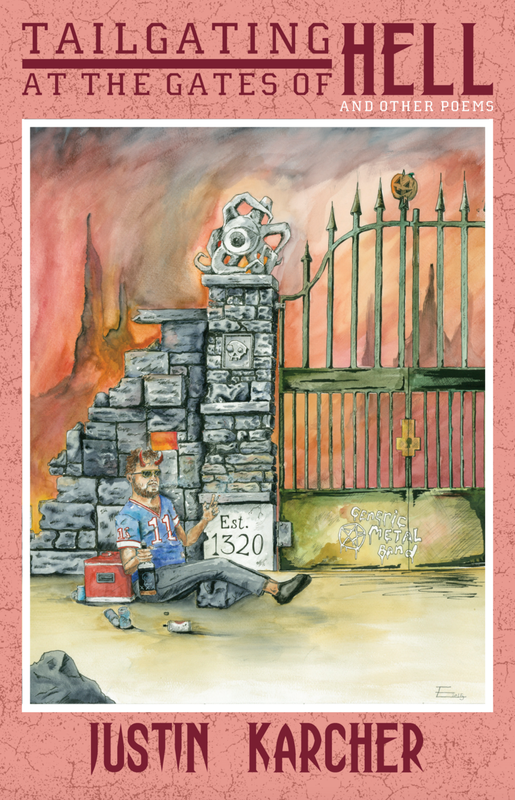 His first book, titled Tailgating at the Gates of Hell, has been released by Ghost City Press and is a collection of poems about growing up in Buffalo. The cover of Karcher’s first book. Most of Karcher’s poems feature attention grabbing titles intertwined with levels of dark humor. Some of these titles include “Snow Angels Going to Their First AA Meeting,” “The Great Abyss Where I Grew Up is Being All Modernized and Gentrified,” and “I Love Being Sleep Deprived in Buffalo” (one which every Canisius student can relate to). Anyone who is from Buffalo knows very well how deeply the city becomes etched into their heart. Karcher describes this feeling throughout his poetry with his analogies to exclusive ideas and items associated with Buffalo. For example, he likened using loganberry to clean the wounds of its citizens over the more sensible idea of water. “In my heart of hearts…I truly feel that I’ve captured the essence of Buffalo,” Karcher said. His poems put into words a feeling that many people can relate to; having a wistfulness in looking at the past and longing to go back, but then to be in the present and be able to appreciate the grand, albeit intimidating, future ahead. Karcher’s title as a poet could be better renamed to more of a vagabond of time, constantly treading through the murky waters of his past and present timeline to piece together who he has become. Karcher layers the serious topics in his poems with levels of dark humor and sarcasm, creating an intellectual conversation with himself. He looks back fondly on adventures with friends through empty parking lots, loud bars, haphazard tailgating, and dating mishaps. Despite the different genres that these stories may come from, they all share the common thread of Buffalo, each with their own twist to somehow tie back into the city. Karcher’s collection of poems speak for a generation of millennials and twenty-somethings that have yet to find an exact purpose in this infinite universe, and have stumbled into adulthood still clutching onto the idea of the American Dream that had been so deeply instilled in them. His personal journey of rising to overcome the challenges of his past mirrors the revival of Buffalo as a powerful city once more, revealing even more how much the city truly runs in the author’s veins. This collection of poems is perfect for anyone who can relate to that same sense of feeling lost but is heading in the right direction. Through this book, Karcher brings Buffalo into a new light that, somehow and in some way, casts the same shadow as those who inhabit it.